I got back late from Elephanta Caves this afternoon still nursing a hangover. It was rush hour and it took me an hour to get back to the flat in heavy Mumbai traffic. There was no way on earth I was gonna make the Jimmy Choo party. I called T and asked him to message his Bollywood friend. It all came good in the end because we met up with her later in a bar called Mai Tai for drinks around 8.30pm. And guess who was sat at the back table? 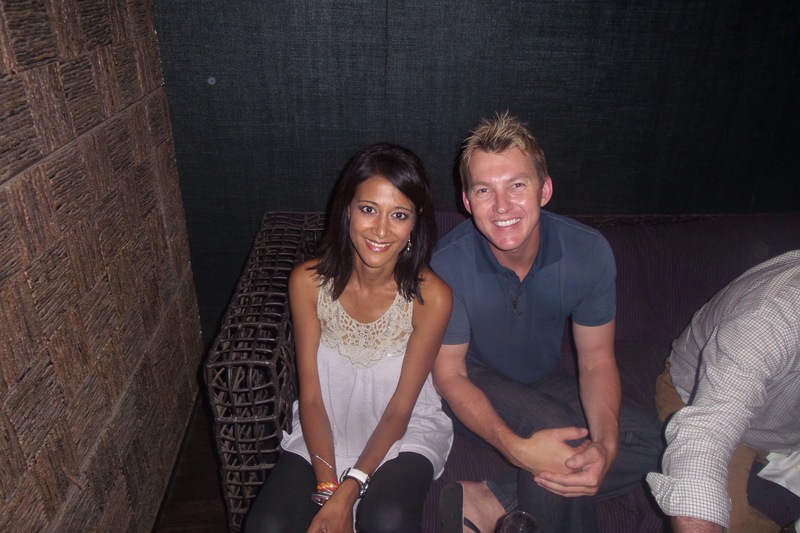 Well you won’t guess because it is quite random – Australian cricket hottie Brett Lee. So I sauntered over and politely interrupted his conversation with five other guys. “Excuse me, so sorry to trouble you Brett, is there anyway I could get a photo with you please? My Ozzie mate will be so chuffed,” I said gushing. We spoke for a bit and then I ran back to T and his friend. “He’s agreed, so come on!” I urged impatiently. T took out his phone and I plonked myself next to Brett. T stood with his legs ligtly bent and leaning backwards as he lined up the iPhone. Smiles all round. The flash went off. “Wait, I’ll just do one more,” he said. The flash went off a second time, but there was a wince in his expression when he looked at the screen. I knew something wasn’t right. “Is it ok?” I said. “It’s fine,” he said lying. Probably out of embarrassment. I thanked Brett and we walked back to our table. “Lemme see,” I urged I said hovering over his shoulder as he sat down. “That could be anyone!” I said frustrated and really disappointed. 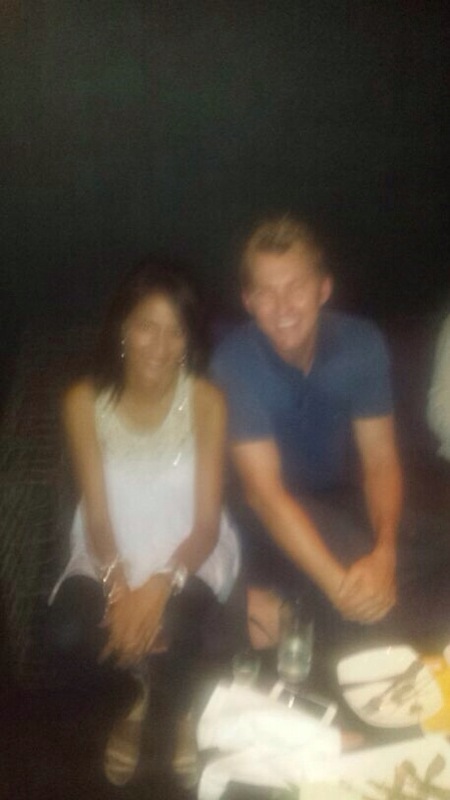 “Well you can tell its Brett Lee but it could be anyone sat next to him, (chuckling)….yes,” joked T.
I sheepishly went back made an apology and asked very nicely again. 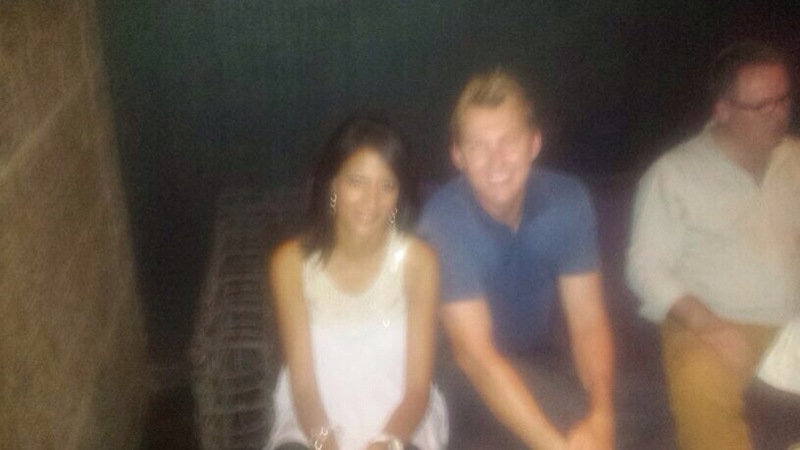 Brett Lee was very sweet and after a small dig, agreed. “In focus this time T, yes?” I said curtly. Third time lucky T used his friend’s camera after she insisted and Boy, I’m so glad that she did. After a small tutorial of which button to press (not rocket science) we had a result. What are the chances aye of meeting a celebrity sportsman in a random bar in Mumbai. So glad I missed that damn shoe party! We Australians are just nice folk. Great photo. wedding it all seems so long ago.